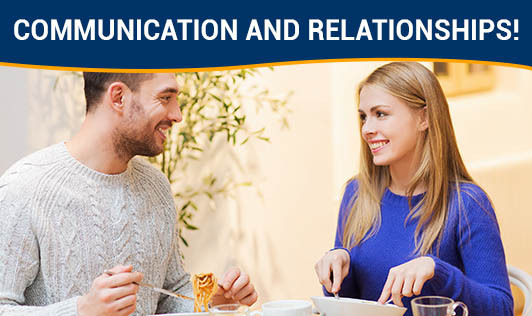 Effective communication leads to strong human relations, which is vital to success in both your personal life and your professional life. The Written word: It is perhaps the most challenging way to communicate with other people because all you have is words on paper. Clarity depends on the effectiveness of the writer and the knowledge base of the reader. Look for words or phrases that might be misinterpreted, and do your best to make them completely clear. The spoken word: Your spoken words play a large part in the relationships you build with the people around you, and the spoken words of others give you greater insight into their emotions and opinions. Choose your words carefully with proper voice tones; you don't want to use words that are too strong or inappropriate for your audience. Listening: How you listen to a person is a big part of the human relations balance. Pay attention to both content and vocal inflections in an attempt to create trust with the speaker. Body language: From posture to handshake to eye contact, your body language affects your relationships with your family, friends and colleagues. Good posture conveys confidence; slouching conveys lack of confidence. Eye contact, or lack thereof, can be a sign of intent or a hint at a lie. Building trust: Trust is a major part of human relations. Any relationship, whether personal or business, will not go anywhere if it lacks basic trust. A trusting relationship invites and encourages opinions and suggestions.